Natural and/or manmade ground movements, is the main reason for water supply damages. Materials used in the production of pipes and fittings, have to be ductile, flexible and resistant to impacts in order to minimize the effect of these movements on networks. Water distribution lines are high-cost investments. Therefore, features like life cycle cost, durability, low operation expenses, ease of assembling, maintenance and repair expenses ought to be considered as well as material unit price in the project designing and feasibility stages. Ductile iron casting adds on tensile strength, impact resistance, and elongation abilities to the superior properties of metal casting which are high resistance to corrosion and abrasion, ease of machinability and fatigue strength. Less operating cost since cast pipes have larger nominal diameter than polyethylene pipes. Preserving the quality of water with healthy interior coating. 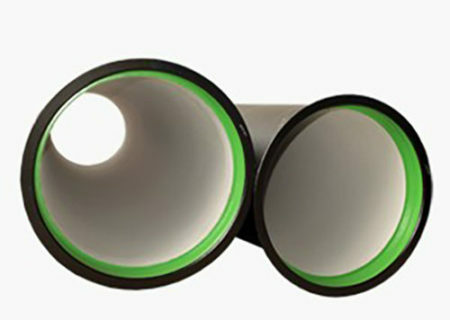 The entire pipes are coated with bitumen paint over zinc or epoxy paint over Zn-AL externally. polyethylene coating is recommended for excessively corrosive grounds. The entire pipes are lined with a cement mortar layer internally, applied by centrifugal technique. According to customer requirements, different types of linings and coatings can be applied.